Author William Mulvihill (1923-2004) was a Cornell graduate that penned a dozen books during his career. Born in New York, Mulvihill joined the Army and acquired the rank of corporal and squad leader during WWII combat at the Battle of the Bulge. After, he settled on Long Island and taught history at Glen Cove High School for 32 years. His emphasis was on African history, stemming from his visits to the continent in the 1960s and 70s. He owned a robust collection of books about Africa and became a scholar and expert on it's natural history. 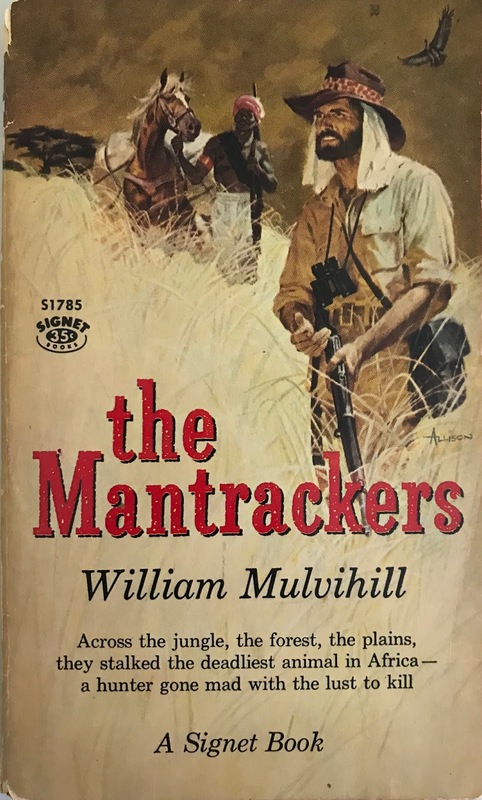 He utilized this passion to fuel his 1960 adventure novel “The Mantrackers”, which later would be re-titled “Serengeti” for the 1995 reprinting. The book introduces us to Captain Pfeffer, who on this January day in 1910 is serving the German Imperial Army in Tanganyika. The hotheaded Pfeffer has a dozen years of wartime in Africa, fiercely fighting in Herero, Bushman and Masai on his destiny to become general. He's a young German enigma, captivating military minds with his fighting prowess, grim determination and career mindset. But, on this day things take a drastic turn for Pfeffer. While hunting, a leopard takes him by surprise, severely mauling and disfiguring him before he can be rescued by soldiers. Hinging on life and death, Pfeffer is taken to a hospital for a long rehabilitative stint. Once Pfeffer heals, the German military discharges him from service due to his appalling appearance. Pfeffer, furious with himself, the military and Africa, returns to the bush as a solo hunter, determined to kill every animal on the continent. With Pfeffer on a seemingly endless killing tear through African game, the news finds former fighting man John Thrustwood. Thrustwood, along with his friend and servant Chapupa, campaigned as trader, farmer and mercenary for the British Army, serving in the Boer War and later establishing himself as one of Africa's premier hunters. Thrustwood, finding Pfeffer's vendetta and mission unacceptable, vows to track and stop him. Soon, Thrustwood, Chapupa and friend Quinell find and confront Pfeffer in the jungle. After disarming him, they take Pfeffer to African officials who place him on a ship to England. Pfeffer escapes and resumes his bloody tirade through the African countryside. Thrustwood and Chapupa now realize they must hunt and kill Pfeffer to end the carnage. Mulvihill is an unusual but talented writer. In “The Mantrackers”, his love of history and African landscapes is awe-inspiring. But, his delivery is of one purpose – simply the storyline. The book has a distinct absence of humor, witty dialogue or a focus on character development. Mulvihill is very serious with his presentation, almost scholarly in the telling of the tale. It was an adjustment for me, the avid reader of more vivid displays of bravado, to accept this storytelling early on. But, a fourth of the way in I not only accepted it – I found it to be personally enjoyable. This is a fantastic adventure story that builds to a fiery crescendo. Pfeffer vs Thrustwood/Chapupa is the main event and Mulvihill pulls no punches. For that, I applaud the author and look forward to hunting down more of his works. 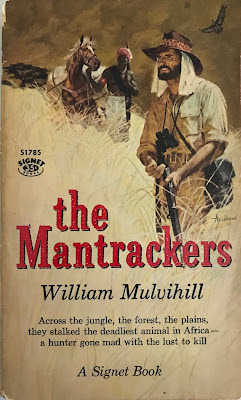 For now, “The Mantrackers” is a respectable and entertaining read from a unique writer.